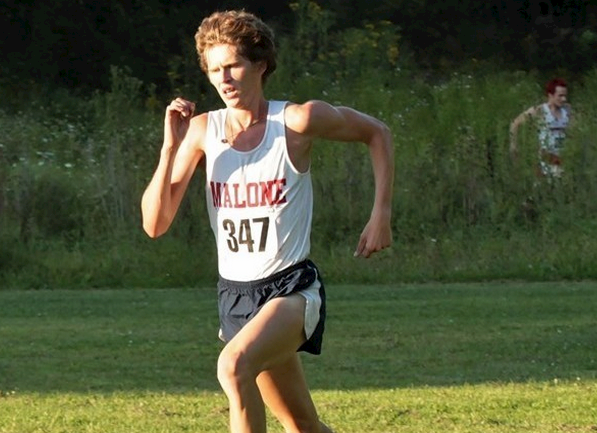 Pedigree: This week’s Pioneer Focus goes to junior cross country runner Ryan Roush, who finished third recently at Southern Indiana University Regional Preview and helped the Pioneers finish second out of a field of nine teams. Roush ran a time of 24:31 to finish third out of 118 runners in the men’s 8K race. Roush’s efforts helped him earn his first GLIAC Men’s cross country athlete of the week honors. Q: What brought you to Malone? A: A decision between two Division II College’s and Malone won out. Q: What has been your best experience running cross country? A: Winning conference in the 10K this past spring. Q: Have you traveled anywhere due to cross country? A: Freshman year, I ran for team USA in Scotland and Jamaica. Q: What do you hope to accomplish this year? A: I hope the team gets top five nationally. Individually, I would like to be an All-American. Q: What do you want to do with your major? A: I want to be a physical therapist. Q: Who do you admire most on the team? A: I’d say my roommate Lorne Straubaugh. Q: What do you want for Christmas? A: Hmmm… Probably just a run in Millcreek Park. Q: What four people, dead or alive, would you take to lunch with you? A: Jack Hazen, Alberto Salazar, Steve Prefontaine, and Galen Rupp. Q: What have you learned from legendary coach Jack Hazen? A: The biggest thing I’ve learned is to just stay patient, which was the first thing he told me as his athlete. Q: What do you want to take away from Malone Athletics once you graduate? A: A good group of friends, some medals, and most importantly, a degree. Q: Do you want to run professionally? A: I don’t know if running professionally is in the cards, but I would say maybe. Would like to get sponsored and get some free shoes. Q: What’s your biggest hobby? A: When I’m not running, I like to play with my rubik’s cube. A: Hopefully a coach and a physical therapist. Justin Davis is a sports writer for The Aviso AVW.